The gender pay gap has slowly been closing over the past decade. The Census Bureau estimates that in 2016 the average full-time employed woman earned 80.3% of what her male counterpart earned. In 2005, that number was 76.7%. But the gender pay gap does still exist and is more than just a number. When women earn less that affects their long-term earning potential and their ability to save for retirement, whether on their own or with the help of a financial advisor. The gender wage gap issue is also not uniformly spread across the workforce. In order to find the occupations with the largest and smallest gender pay gaps, SmartAsset analyzed data for full-time working men and women. Check out our data and methodology below to see where we got our data and how we put it together. 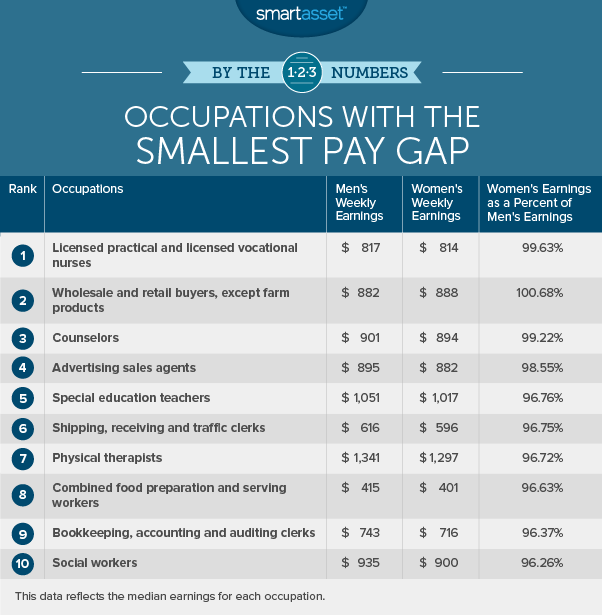 This is SmartAsset’s second annual study on the occupations with the largest and smallest pay gaps. See the 2017 edition of this study here. Pay is closest lower down the earnings ladder – Occupations with lower earnings typically have a lower pay gap. However, this is entirely due to a decrease in men’s earnings. Average women’s earnings in the top 10 occupations with the largest pay gap is roughly equivalent to their average earnings in the occupations with the smallest pay gaps. For men, weekly pay is almost $400 less, on average, in the occupations with the smallest pay gaps. Finance is still unbalanced – Four of our top 10 occupations with the largest pay gaps are in finance. That list includes financial advisors, securities, commodities and financial services sales agents, financial managers and credit counselors and loan officers. Last year we found similar results with regards to gender pay gap in financial occupations. 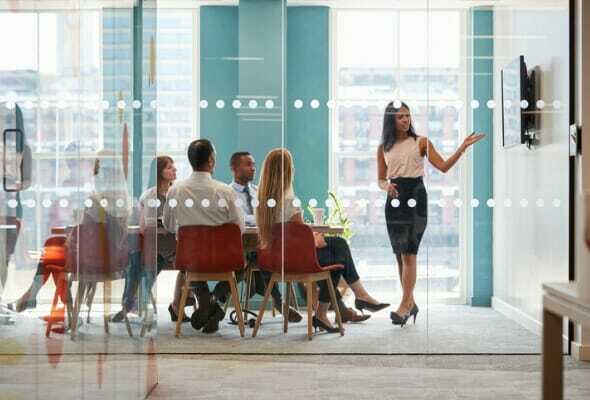 Women don’t leave occupations with large pay gaps – Despite the high pay gap in occupations like securities, commodities and financial sales agents, janitorial workers and taxi drivers, the number of women in those occupations is growing. The number of women working in each of those occupations increased by at least 8% from 2016 to 2017. Women are not flocking to occupations with a small pay gap, either. The number of female physical therapists fell by 8%, the number of licensed vocational nurses dropped by 10% and the number of women working as retail and farm product purchasing agents fell by 30%. 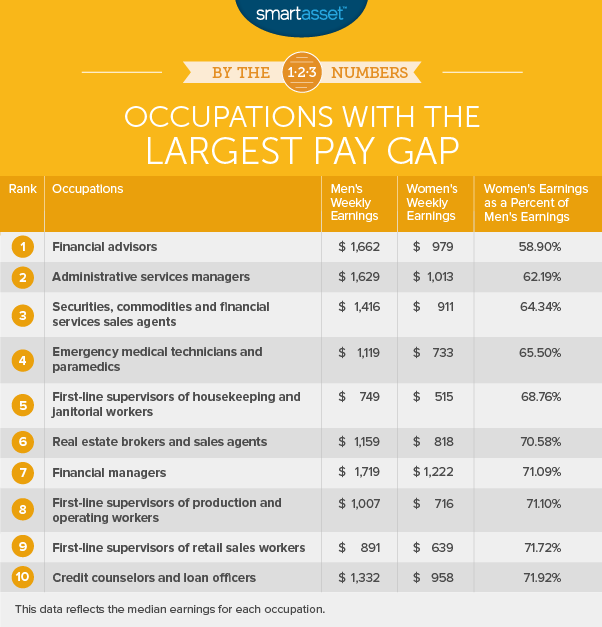 Each of those occupations has a pay gap of less than 6%. Financial advisor remains the profession with the largest pay gap, according to data from the Bureau of Labor Statistics. The good news for women in this profession is that the wage gap is shrinking. In 2016, female financial advisors earned 55.6% of what male advisors did, on average, and in 2017, that number was up to 58.9%. This is still a good profession for women to get into. According to our data, the average female financial advisor earns about $50,900 per year. For men however that figure is about $86,400. One concerning trend is the lack of women employed as financial advisors. In 2017, there were about 131,000 female financial advisors, meaning they made up about a third of the profession. That is down from last year. Despite the total number of employed women growing by over 1 million from 2016 to 2017, the number of women employed as financial advisors dropped by 11,000. Administrative services managers climbed from seventh last year to second this year. The average women working in this profession earns $1,013 per week, an increase of $61 from the previous year. However, on average, men received a much larger raise which is why the pay gap increased. The average man in this profession earned $1,629 per week in 2017, an increase of $231 from the previous year. On average women who work as administrative services managers earn 62% of what men who work as administrative services managers earn. Another finance-related occupation takes third. You are nearly twice as likely to see a man working in this profession compared to a woman. Data from the BLS shows that only 77,000 of the 231,000 securities, commodities and financial services sales agents are women. Looking at the earnings data, you can see why women may not be attracted to this profession. On average, women are paid only 64% of what men are paid. In terms of yearly salaries, women earn $47,300 on average while men earn $73,600. Women who work as emergency medical technicians and paramedics earn 65% of what men in the same profession do, according to the latest BLS figures. This is quite a steep decline from a year ago when the average woman working in this profession earned closer to 80% of what the average man did. This is another male-dominated occupation. The number of women working in the profession dropped by 3% from 2016 to 2017. First-line supervisors of housekeeping and janitorial workers comes in fifth. Workers in this occupation are tasked with organizing teams of housekeeping personnel and can typically be found in hotels or hospitals. Women in this occupation earn $515 per week, on average, compared to $749 for men. That means the average woman in this occupation earns 68.7% of what the average man earns. This is the first profession in our top 10 where women outnumber men. According to BLS data, in 2017 there were 269,000 female real estate brokers compared to 219,000 male real estate brokers. However this has not stopped women from getting the short end of the stick when it comes to pay. The BLS estimates the average female real estate broker earns 70.5% of what the average male real estate broker earns. This occupation is the highest paying in our top 10. The Bureau of Labor Statistics estimates that the average man working in this job full time earns about $89,400 per year. Women earn 71% of that number, which in terms of an annual salary equals $63,500. Despite the pay gap, this occupation is becoming a woman-dominated occupation. From 2016 to 2017, the number female financial managers increased by 50,000 while the number of male financial managers decreased by 27,000. Members of this profession organize and coordinate workers who produce goods. One task for workers in this occupation includes enforcing safety and sanitation regulations. Women who work as first-line supervisors of production workers are relatively rare. In total only 18% of the workforce in this occupation is female. On average female workers in this profession earn about 71% of what males do. First-line supervisors of retails sales workers takes ninth and is the third “first-line supervisor” occupation in this top 10. On average woman in this occupation make $639 per week compared to men who earn $891 per week. That equals a pay gap of just under 72%. It is a close race for the final spot in this top 10. Credit counselors passed taxi drivers and truck drivers by less than 1%. There were about 190,000 female credit counselors and loan officers as of 2017. On average they earned $958 per week. Meanwhile around 130,000 men held the title of credit counselor or loan officer in 2017 and they earned an average of $1,300 per week. That leaves women in this occupation with a pay gap of 72%. Vocational nurses work under registered nurses to provide basic care. Earnings data from the Bureau of Labor Statistics shows that this occupation has the smallest gender pay gap in the country. On average both men and women earn around $815 per week which is about $42,400 per year. This is becoming a more popular career for men. As of 2017, there are nearly seven times as many female licensed vocational nurses as there are male vocational nurses. But in 2016 there were 10 times as many female licensed vocational nurses as male licensed vocational nurses. Men and women employed as wholesale and retail buyers earn an almost identical amount. According to our data, the average female wholesale buyer earns $888 per week compared to $882 for men. This is not the most popular occupation nationwide. There are 154,000 wholesale buyers nationwide, of which, 55,000 are women. Counselor is another profession where men and women are evenly paid. The average male counselor makes $901 per week and the average female counselor makes $894 per week. Overall this profession saw pay remain mostly unchanged from 2016 to 2017, with the average female counselor’s pay dropping by $13 per week and male counselor’s pay increasing by $9 per week. There is almost no gender pay gap in the ad sales business, according to Bureau of Labor Statistics data. Women who work as advertising sales agents make $882 per week and men make $895 per week, on average. One concern for all advertising sales agents is the falling earnings. The BLS estimates that from 2016 to 2017, average pay for advertising sales agents fell by 13%. Special education teachers is the second-highest paying occupation within the top 10 occupations with the smallest pay gaps. The average man working as a special education teacher makes $1,051 per week. The average women in the same role makes $1,017 per week, meaning women on average earn 97% of what men earn. For women this is the 40th-highest paying occupation while for men it is the 62nd-highest paying occupation in this study. While working as a shipping, receiving and traffic clerk may come with a small pay gap, the profession isn’t a very high paying one. Women earn nearly 97% of what men earn in this occupation, however women only earn about $600 per week, on average. That makes it the 88th highest-paid occupation for women in this study. For women who want to earn a good living and earn the same amount as their male peers, working as a physical therapist is a tough gig to beat. The average female physical therapist earns over $67,400 per year, making it the 15th-highest-paying occupation for women in this study. Men do earn more in this occupation but not much. On average, they earn $69,700 per year. This is not exactly a popular occupation and the number of women choosing it as a career option is dwindling. According to our data, in 2017, 118,000 physical therapists were women down from 128,000 in 2016. Working in fast food isn’t high paying. Both men and women who spend the majority of their careers in the fast food industry may struggle to save for retirement or have much disposable income to invest. According to our data, working full time as a fast food preparation worker will yield earnings of $20,800 for women and $21,500 for men, on average. The work of bookkeeping clerk is mostly done by women. In 2017, according to data from the Bureau of Labor Statistics, there were 625,000 women in this occupation compared to 92,000 for men. On average, both genders receive similar wages and there is a gender pay gap of only 3.7%. Unfortunately for men parity in pay has come at the expense of their earnings. From 2016 to 2017 women’s average earnings in this profession stayed the same while men’s dropped by 6%. The occupation with the 10th-smallest gender pay gap is social worker. Male social workers earn $935 per week and female social workers earn $900 per week. That translates to women earning 96.2% of what men earn. The main reason that the gender pay gap in this occupation has shrunk is the declining pay for men. From 2016 to 2017, the average male social worker saw their income drop by 10%. There is one occupation where women earn more than men by a wide enough margin that you could argue there is a gender pay gap in favor of women. The average woman working as a bartender helper or cafeteria attendant earns 108% of what the average male in the same occupation earns. However neither women nor men in this occupation earn much. Full-time working women in this occupation earn only $25,012 per year, on average. Median weekly earnings for women. This is the median weekly earnings for women who work full time. Median weekly earnings for men. This is the median weekly earnings for men who work full time. Data for both metrics comes from the Bureau of Labor Statistics and are from 2017. To rank the occupations, we divided the median weekly earnings for women by the median weekly earnings for men. Doing this we found median weekly earnings for women as a percent of median weekly earnings for men. We ranked the occupations from smallest to largest (where women earned the least compared to men). To rank the occupations with the smallest pay gap we looked for the occupations where there was the smallest difference between men and women’s earnings as measured by women’s earnings as a percent of men’s earnings. This means in some of the occupations with the smallest pay gap women earn more than men, on average. For our final rankings, we did not include occupations with the phrase “all other” in them due to a lack of specificity. Take advantage of your employer’s 401(k) match. Many employers offer a 401(k) match worth a certain percentage of your gross salary. For example, let’s say your employer matches 100% of your 401(k) contribution up to 2% of your gross salary. If you contributed 2% of your gross salary a year and your employer matched that, you would have saved 4% of your gross salary. By maxing out your employer contributions you functionally doubled your savings rate without lifting a finger. Consider opening an IRA – If your employer does not offer a 401(k), another great option to boost your retirement savings is to open an IRA (individual retirement account). A traditional IRA allows you to contribute pre-tax dollars and then pay taxes on your contributions when you withdraw from the account in retirement. This also allows you to lower your taxable income so you may also lower your overall tax bill. Decide between a traditional IRA vs. Roth IRA – A traditional IRA isn’t your only option. People who think they will be paying more taxes in retirement should consider opening a Roth IRA. You’ll fund a Roth IRA with post-tax dollars, meaning you can withdraw your money tax free in retirement.